On August 2, Judas Goat Donald Trump signed a bill imposing new crippling sanctions against Iran, North Korea and Russia, passed earlier by 532 US lawmakers in favor and 2 against it. Iran ignored the new sanction being used to them since 1980s while North Korea told Washington to GO TO HELL – and Moscow expelled 755 US diplomats in response. The pro-Israel idiot in the White House, instead of expelling some Russian diplomats from Washington as retaliatory move – thanked Putin for helping the US Treasury to save millions of dollars by reducing US embassy staff in Moscow. Donald Trump was forced to ratify the new sanctions on Russia as result of heavy ponding from both Congress and Senate – but his administration’s bullying Iran and North Korea is not that Iran or North Korea has threaten to wipe United States off the map, but because the regimes in those two countries have refused to accept the Jewish occupation of Palestine. Last week, The Jew York Times published a report by Israel-First Jew journalist David E. Sanger entitled ‘Trump Seeks Way to Declare Iran in Violation of Nuclear Deal’ said that Donald Trump has instructed his national security advisers to find a rationale for declaring that Iran is violating the terms of the accord. Although last month, US ambassador to the UN Nikki Haley, an Israeli poodle, testified before the US House of Representatives committee on Iran’s nuclear and said that in reference to the JCPOA, we’re not seeing any sort of violations of that although she did mention that they’re going to continue their nuclear capabilities and we just gave them a lot of money (??) to do it with following Trump’s view that the Iran’s nuclear deal was bad to begin with. 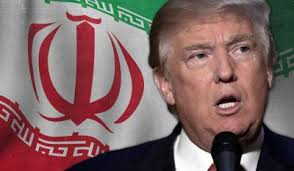 On July 28, 2017, Trita Parsi, PhD, founder and president of the National Iranian American Council, posted an article, entitled, The Mask is off: Trump is seeking War with Iran. Dr. Parsi is a non-Muslim and anti-Islamic government in Iran. He was a child when his parents immigrated to United States after the 1979 Islamic Revolution. “President Donald Trump has made it clear, in no uncertain terms and with no effort to disguise his duplicity, that he will claim that Tehran is cheating on the nuclear deal by October—the facts be damned. In short, the fix is in. Trump will refuse to accept that Iran is in compliance and thereby set the stage for a military confrontation. His advisors have even been kind enough to explain how they will go about this. Rarely has a sinister plan to destroy an arms control agreement and pave the way for war been so openly telegraphed,” Parsi said. “Trump’s confidence may be misplaced on two levels. First, abusing the inspection mechanisms of the deal may prove harder than Trump has been led to believe. The inspections are the cornerstone of the deal, and Iran’s ability to cheat on the deal is essentially non-existent as long as the integrity and efficiency of the inspections remain in tact. But if Trump begins to abuse the mechanism to fabricate a conflict, he will end up undermining the inspections regime and actually enhance the ability of those in Iran who would like to pursue a covert nuclear program. Precisely because of the commitment of Europe and others to non-proliferation, they are likely to resist Trump’s efforts to tinker with the inspections. Second, by revealing his hand, Trump has displayed his duplicity for all to see. That includes the American public, whose anti-war sentiments remain strong and are a key reason they supported the nuclear deal in the first place,” said Parsi. “The American public knows the Iraq playbook quite well. Trump’s own supporters remain enraged by the disastrous war with Iraq. They know how they got played. It’s difficult to imagine why they would allow themselves to get played again by a president who has left little doubt about his intent to deceive,” concluded Parsi. This entry was posted in World News. Bookmark the permalink.